Distribution and habitat: Strelitzia reginae is a tufted, evergreen, acaulescent (stemless) perennial herb which occurs naturally only in South Africa: eastern coast, from Humansdorp to northern KwaZulu-Natal in coastal bush and thicket. It grows along river banks in full sun, however sometimes it occurs and flowers on margins of forest in shade. 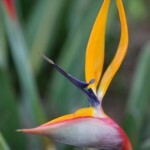 Strelitzia reginae flowers are pollinated by sunbirds, which use the spathe as a perch when visiting the flowers. The weight of the bird when standing on the spathe opens it to release the pollen onto the bird’s feet, which is then deposited on the next flower it visits. Strelitzia reginae has been introduced into parts of central and tropical South America and is widely cultivated as an ornamental. Description: Strelitzia reginae are clump-forming plants with big, dark green leaves on long leaf-stalk in a fan-like arrangement and strangely shaped strikingly colourful flowers. It is a large plant in the wild, but its growth is considerably restricted in a pot or small tub, where it will grow no taller than 1m (3 feet) or so. This restriction encourages early flowering. The leathery leaves which are oblong to spear-shaped, 30-38cm (12-15 inch) long and 8-15cm (3-6 inch) wide, have sturdy, cylindrical leaf-stalk 30-75cm (12-30 inch) long. 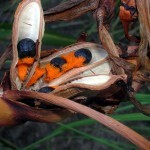 The stalk rise from sheaths in the base of the plant. These plants flowers when they are about six years old. Thereafter, they produce crested flower heads every year on stalks about 1m (3 feet) long that rise from the axils of the lower leaves in spring and early summer. The remarkable flower head consists of a 20cm (8 inch) long, boat-shaped bract held in a nearly horizontal position, from which a succession of three-petaled flowers emerge during the course of several weeks. These erect blooms, each up to 15cm (6 inch) long, give the flower head its crested appearance. The boat-like bract is green, through it is something flushed with purple or red; the flowers are bright orange; the tongue-like projections are dark blue or purple. Individual flowers last for about a week, but a single boat-shaped bract will produce several flowers in succession. When not in flower, the plant still has a striking appearance due to the large glaucous leaves which resemble those of banana plants. Houseplant care: Apart from its need for sunlight along with a cool winter rest period, this exotic plant is not particular difficult for the amateur indoor gardener to grow successfully. It is a slow growing plant that make it perfect for growing indoors. Light: Give these plants bright light with at least three or four hours a day of direct sunlight. They will not flower if grown in inadequate light. Temperature: During the active growth period Strelitzia reginae will do well in normal room temperatures. They need a long cool rest period during the autumn and winter months, however the temperature should be kept at around 13°C (55°F). Water: During the active growth period water moderately, giving enough at each watering to make the potting mixture moist throughout but allowing the top couple of centimetres (0.8 inch) or the potting mixture to dry out well before watering again. During the rest period give just enough to prevent the mixture from drying out completely. Potting and repotting: Use a soil based potting mixture. Move young plants into containers one or two size larger each spring until the maximum convenient pot or tub size (probably 20-30cm (8-12 inch)) has been reached. Thereafter top-dress the plants with fresh potting mixture in spring. Apart from the annual top-dressing, do not disturb mature, flowering plants. They are likely to stop flowering for a year or two if subjected to any sort of displacement. Garden Culture: Winter hardy to zones 9 to 11, Strelitzia reginae is an easy plant to grow in the garden. They are, however, very tolerant plants and will thrive in most soils and can survive with very little water once established. 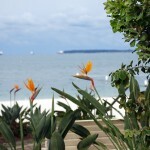 The plants are also wind resistant and grow well in coastal gardens. In cold climates, it is better to grow them in containers that can be moved indoors when freezing temperatures are expected. When temperatures rise above 21°C (70°F) outside, place your plant in a semi-shaded location with good air circulation. Remove dead leaves and flowers as they occur. 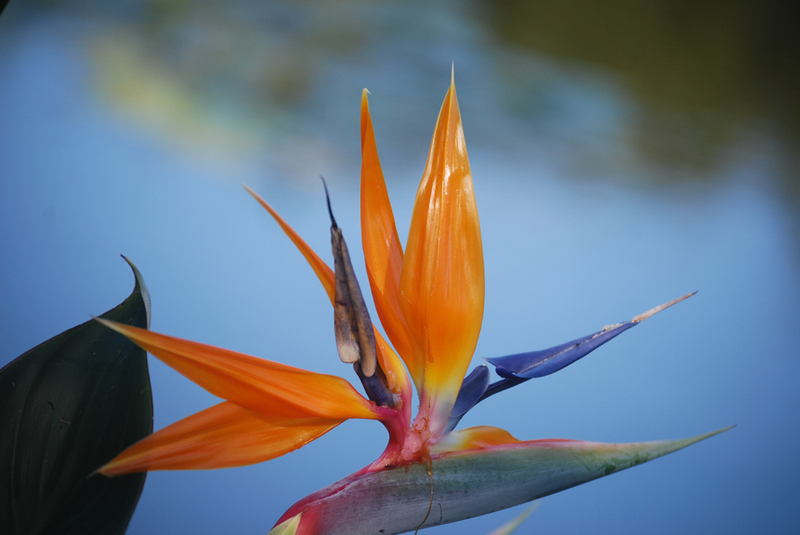 Position: Strelitzia Reginae needs full sun to light shade with warm temperatures, however it will grow best when it receives a minimum of four hours of direct sunlight a day, but they should have bright light all day. They like a mild climate with evenly distributed rain during the year. They will produce the most flowers when planted in bright sun, but the best-looking foliage when planted in shade, in which case, there will be fewer flowers. Soil: They will grow in most types of soil as long as it is well-drained, but they do best in rich acid soil. In other soils, rotted manure or a time-release fertilizer should be added to the hole when planting as these plants will use much nourishment from the soil. Dig a hole at least twice the size of the rootball. At a minimum, make the hole 0.6m (2 feet) in diameter and 0.3m (1 feet) deep. It also is a good idea to finish with the hole 2.5 or 5cm (1-2 inch) recessed so that a watering basin is formed. 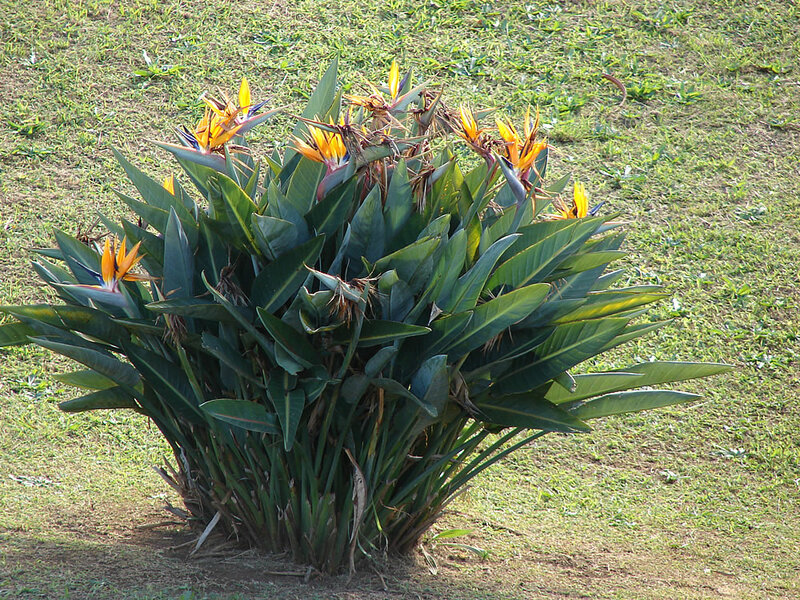 Irrigation: Tropical Strelitzia reginae plants do well on a grass watering schedule. Basin or flood irrigation is recommended because it helps keep the salt from water from accumulating around the roots. Furthermore, deep watering will encourage the plant to develop deeper roots, making it tougher when the weather gets hot and dry. Fertilising: The plants should be fertilized monthly. Slow release chemical fertilisers are recommended and varieties that also acidify the soil will help the plant look greener. 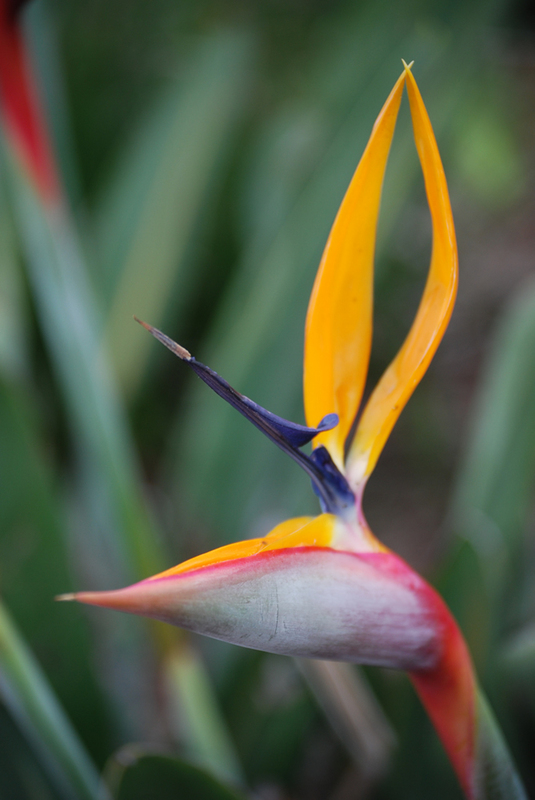 Propagation: Propagate Strelitzia reginae in spring by divining old, overcrowded clumps or by gently separating a section with two or three leaves with some roots attached from any mature plant. Pot the small section in a 13-15cm (5-6 inch) pot of soil-based potting mixture and place it in a warm spot in bright filtered light (but no direct sunlight) for six weeks. During this period do not feed the small plant and water it sparingly, allowing a full half of the potting mixture to dry out completely between waterings. By the and of the sixth week the roots will have become active in the new pot, so treat the plant as recommended for a mature specimen. It will normally flower in two to three years. 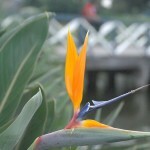 Strelitzia reginae can also be grown from seed. This is an extremely slow process, though. It involves a wait of possibly as long as 10 years before any flower are produced. 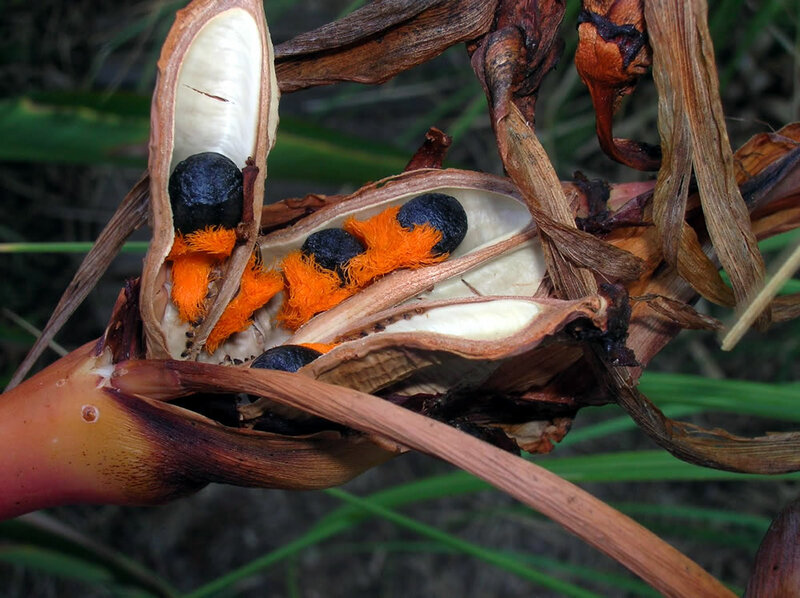 Scale and mealybug insects sometime attack Strelitzia reginae. Look for them from time to time near the midrib on the underside of leaves, which is where they are usually found. Treatment: Use an adequate pesticide. Flowering problems: Usually needs at least four years to begin flowering, but it is not uncommon for blooming to take 10 years or more. To encourage the plant to bloom, allow it to become root-bound. Instead of regularly repotting it, keep the plant snug and happy by adding just a layer of fresh potting soil each spring. Also might be considered supplemental lighting. 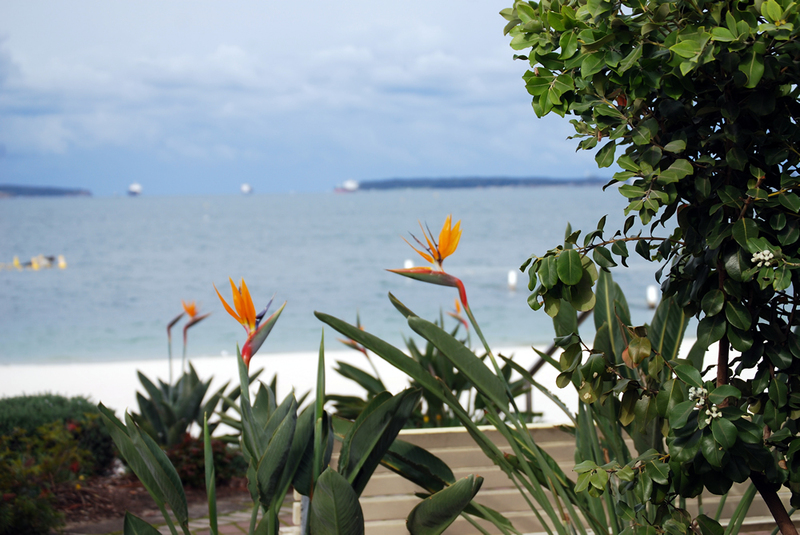 While the foliage looks healthy, to produce flowers that bloom in late winter or spring, bird of paradise needs as much bright light in fall and winter as it does in spring and summer. Finally, evaluate your fertiliser schedule. 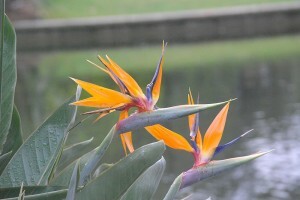 Strelitzia reginae needs water-soluble fertilizer every other week in spring and summer. Too little fertilizer can inhibit flowering; too much can produce lush foliage at the expense of flowers. 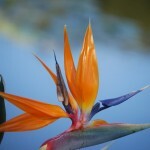 Cutting flowers: Strelitzia reginae flowers and leaves are long-lasting in flower-arrangements. Flowers can be picked as soon as the first signs of colour show on the bill of the bud. They will then progressively come out and will last for up to a month if the water is changed regularly and they are kept in a well-lit situation. The leaves also last well. Note: It is an relative of bananas trees. 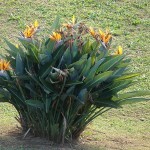 Uses: Strelitzia reginae is highly-prized and widely cultivated as an ornamental. Strelitzia reginae are the only plants from its genus that can be grown indoors. They can be potted as indoor plants and they make a showy and non-messy plant beside swimming pools. 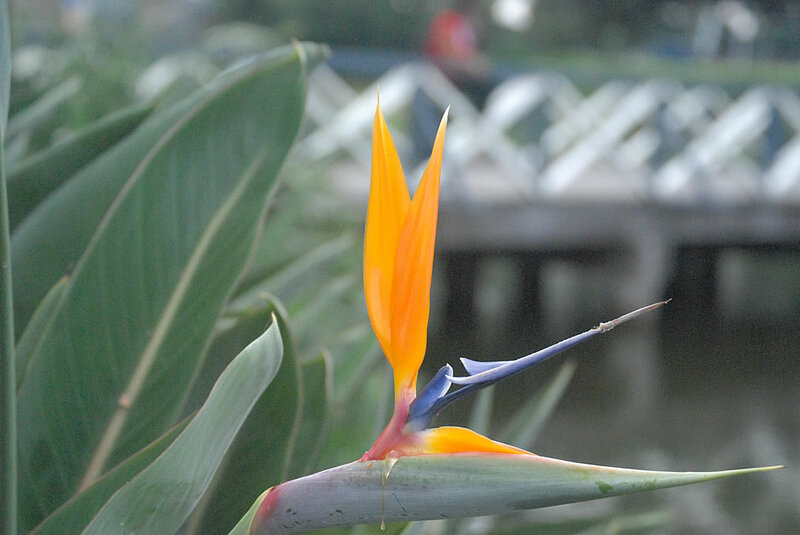 Strelitzia reginae is widely used in landscaping as an architectural plant and focal point. Also, it is grown for its spectacular flowers and are used all over the world for cut flowers in exotic floral displays.